The city of Atlanta, very near where I live, is a fan convention paradise. Not only is it the site for DragonCon, a mega-convention for fans of science fiction and fantasy, a wild, wonderful, sprawling event where the Atlanta Radio Theatre Company performs every year; it’s also the home of Anime Weekend Atlanta, a convention that celebrates Japanese animation in its multitudinous forms. My husband, Matt Ceccato, got me interested in anime before we were married, and persuaded me to come to AWA with him; we’ve been back every year since. The convention has much to offer: lots and lots of screenings of anime old and new, discussion panels on everything from anime history to cosplay, and a manga reading library. But my very favorite thing — the thing to which I look forward year after year — is Artist’s Alley, where gifted artists congregate to share their visions of characters both in anime and in pop culture in general. Some of these artists will take commissions; tell them what you want them to draw, and they’ll produce a brilliant work to your specifications. 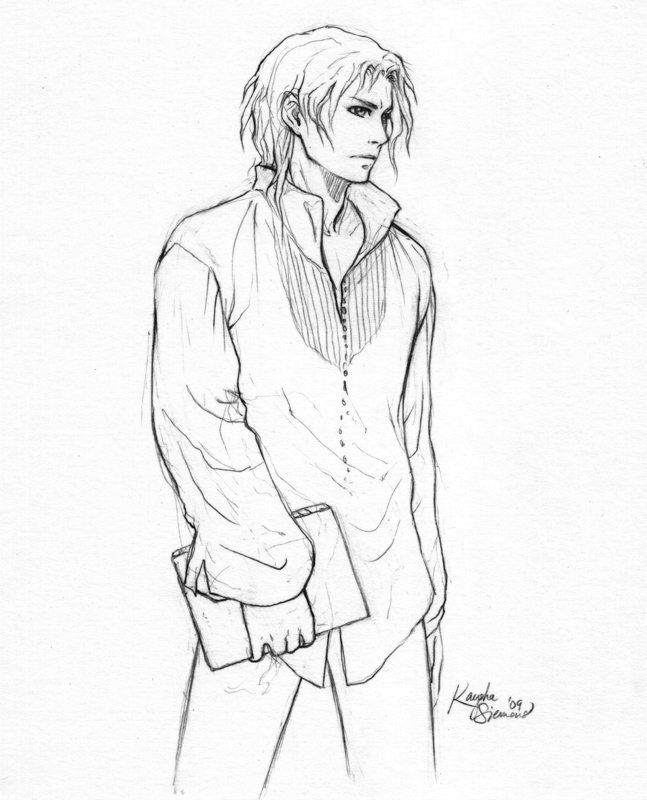 A few years back, I started sniffing around Artist’s Alley with an idea: I wanted to see what characters from my stories might look like if I ordered drawings of them, if I gave the artist a brief description of the image in my head. First I had to find an artist whose drawings matched my vision, and I found Kaysha Siemens. From the descriptions I gave her, she drew the above pencil portraits of Baltasar, Meinrad, and Nichtel, the three major characters from my upcoming novel Atterwald. They fit my vision so perfectly that every year since, I’ve gone back to her with new commissions. I’ll be sharing more drawings in future posts. Perhaps my favorite thing about it is that at the time I asked for these three portraits, I hadn’t even finished Atterwald‘s first draft. With the drawings I had a new reason to push myself to the conclusion, and to make their story as engaging as possible. Those penciled faces looked up at me and demanded that I bring them fully to life, not just for myself but for others who might enjoy their company. They wanted to be known. So I learned the value of commissioning portraits of characters whose stories are still in progress or may still be in the conception stage. Once drawn, they have a more tangible reality than just an idea in my head, and I simply can’t let them down. I have to help them become what they were meant to be. 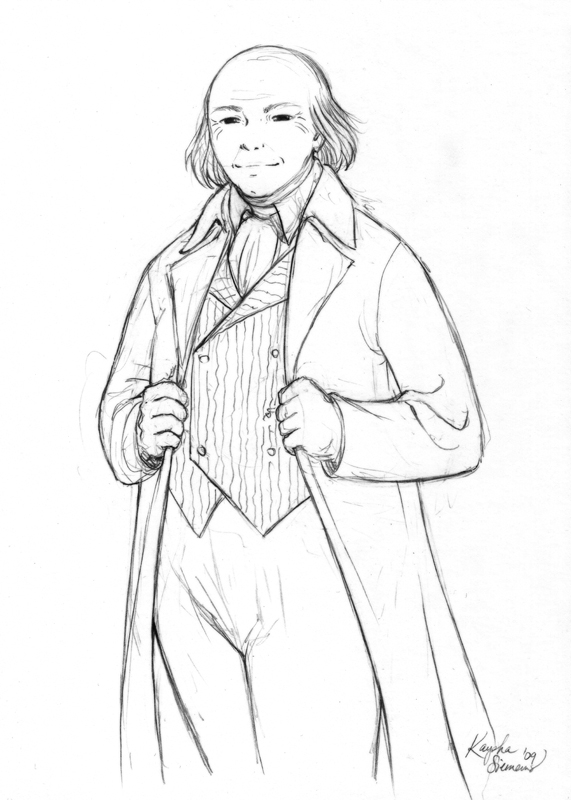 So here is Baltasar, my ambitious and cold-hearted wizard, looking like a jovial Claude Rains (but don’t trust him). Here is Meinrad, his sickly, rebellious son, looking appropriately edgy. 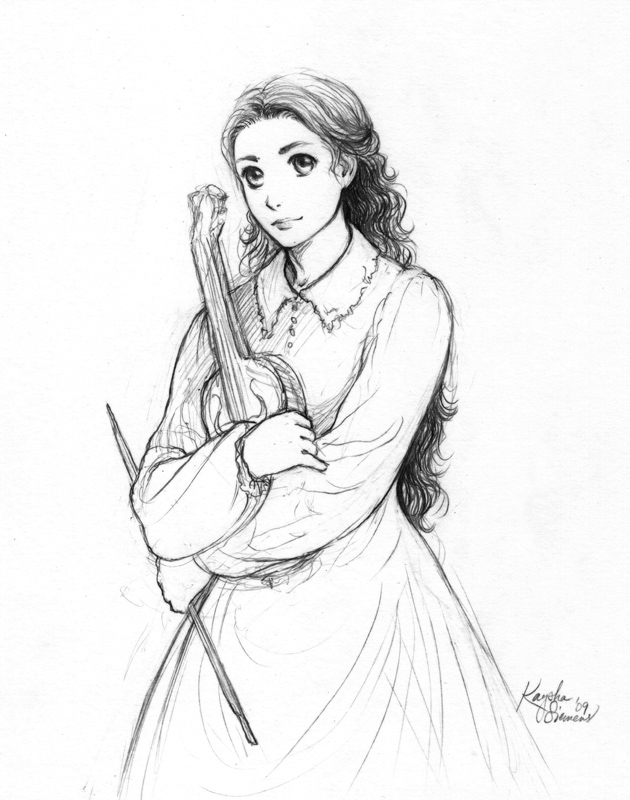 Here is Nichtel, the violinist whose music has strange powers; her eyes radiate hope. Soon you’ll have a chance to get to know them.